The UCA Core, described here, becomes effective for incoming undergraduate students in Fall 2013. For the UCA General Education Program, in effect through the 2012-2013 academic year, see the relevant page in UBulletin 2012. Students who entered under the requirements of the General Education Program may opt for the UCA Core and should speak about this option with their academic advisor. Mission of the UCA Core: The UCA Core is designed to help students develop the knowledge and skills necessary for critical inquiry, effective communication, and responsible living in a diverse and changing world. Values of the UCA Core: The overarching goal of the program is to develop curious, knowledgeable, articulate, and ethical people who are prepared for greater success in future learning and who are willing and able to make effective contributions to their communities. Students completing the UCA Core program will demonstrate these goals and outcomes. Goal 1: Analyze their own cultural assumptions in the context of the world’s diverse values, traditions, and belief systems. Outcome a: Articulate one’s own cultural values and assumptions. Outcome b: Compare cultural values across a range of cultures. Outcome c: Respond to complex questions with answers that reflect multiple cultural perspectives. Goal 2: Analyze the major ideas, techniques, and processes that inform creative works within different cultural and historical contexts. Outcome a: Identify creative techniques and processes and their relationship to ideas and themes in creative works. Outcome b: Evaluate the relationship between creative works and the cultural and historical context in which they are created. Goal 1: Demonstrate a knowledge base that helps them ask more informed questions and learn more complex concepts. Outcome a: Demonstrate an understanding of the basic concepts and principles in the discipline. Outcome b: Find and evaluate appropriate information based on knowledge of subject and technology. Outcome c: Apply appropriate modes of academic inquiry and analysis to develop and evaluate a position on significant questions in the discipline. Goal 2: Use scientific, quantitative, and computational processes in order to solve real-world problems. Outcome a: Apply scientific processes to solve problems. Outcome b: Apply quantitative and computational processes to solve problems. Goal 1: Develop and present ideas logically and effectively in order to enhance communication and collaboration with diverse individuals and groups. Outcome a: Use appropriate conventions and strategies in oral communication for various audiences and purposes. Outcome b: Use appropriate conventions and strategies in written communication for various audiences and purposes. Outcome c: Individually apply appropriate verbal and nonverbal strategies to promote collaboration. Goal 1: Describe ways in which ethical principles affect human choices. Outcome a: Explain ethical dimensions of human choices. Goal 2: Analyze the effect that decisions have on self, others, and the environment. Outcome a: Recognize the consequences of decision making. Goal 3: Evaluate and practice strategies leading to individual and social well-being. Outcome a: Evaluate practices that lead to personal and social well-being. Follow this link to the current lower-division UCA Core check sheet: check sheet link. The UCA Core’s upper-division requirements will be phased in by Fall 2015. Students should consult their academic advisors for clarification about upper-division requirements that apply to them. Once the upper-division core is implemented, students will be required to take upper-division courses that address outcomes in each of the four areas of the UCA Core: Diversity (D), Critical Inquiry (I), Communication (C), and Responsible Living (R). These courses may also count as major, minor, or elective requirements, and one course may satisfy up to two Core requirements, as long as the outcomes for both areas are assessed. The UCA Core capstone requirement will be implemented on the same timeline as the rest of the upper-division Core requirements. 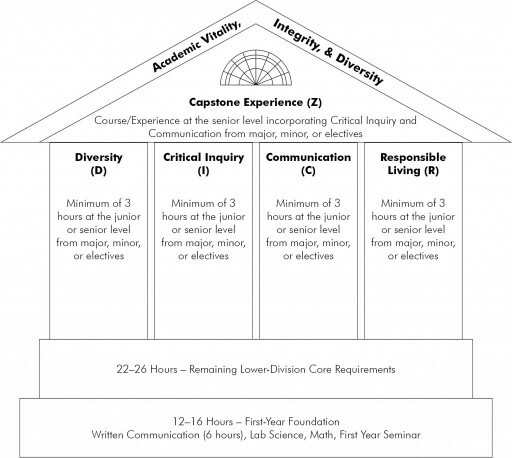 The required capstone will, in addition to any disciplinary goals and outcomes, address certain UCA Core goals and outcomes in Critical Inquiry, Communication and Collaboration.